Surfside Girls: The Secret of Danger Point is the debut graphic novel by Kim Dwinell, and I have to say it is a fantastic debut and a great book in its own right. The main characters, best friends Samantha and Jade, encounter a supernatural mystery during their summer vacation. The two are really likable and over the course of the story their friendship and perseverance are a highlight of the story. The artwork is simply fantastic. It reminds me a lot of the Nickelodeon animated series Doug. The characters have big, simple faces but are incredibly expressive. There’s a diverse cast here and each character feels distinct. Certain characters will pop up throughout the story and are easy to recognize, even if they had no dialogue. Overall the artwork is incredible in its detail and simplicity. Seeing the main duo just surf feels serene. It’s just a cozy book with a pleasant style that is easy to take in. This book is an incredibly fun story from beginning to end that was hard to put down. Great characters and a satisfying story makes this graphic novel the full package in my opinion. This new take on the magical girl genre is off to an awesome start! One thing I love about comics is the ability to tell stories with different types of genres, characters, settings, and art styles to create something unique, interesting, and hopefully entertaining. 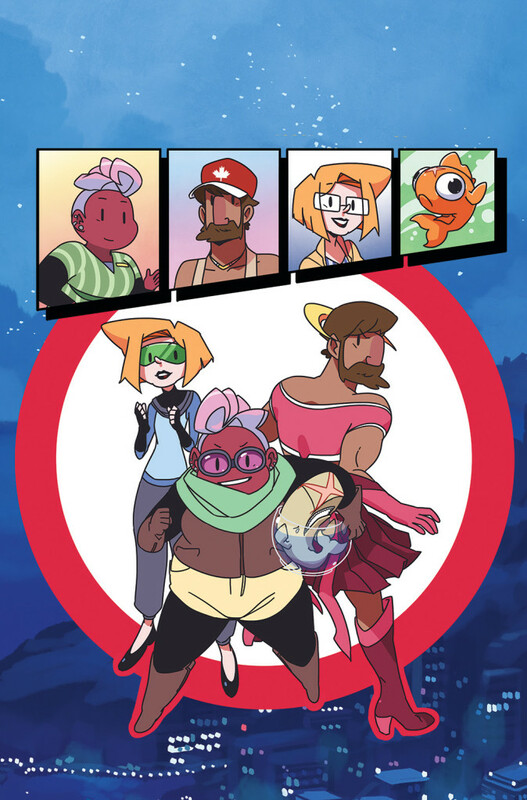 I can wholeheartedly say this about Power Up, a book that has a delightfully animated art style, along with a great cast and unique premise that makes it really entertaining. As far first issues go, this book hits it out of the park and makes me psyched for more. Power Up stars Amie, a young woman with a normal job, a pet porcupine, and an easygoing lifestyle. While her job my be boring and her boss a little high-strung, she is perfectly content, friendly, and pretty dang lovable. Things get a little strange however when a flash blinding light and a mysterious intruder brings about a major change in her everyday routine. One thing that stands out in Power Up, besides the awesome artwork of Matt Cummings, is the characters. This book has one of the most diverse cast of characters I’ve seen in a while. Not just racial and gender diversity, but characters with different body types as well; Amie herself is plus-sized. I believe that diversity and representation are never a bad thing; this may be a non-issue for some, but I certainly appreciate it. Writer Kate Leth does a great job of making these characters seem real and easy to relate to. There’s a scene in the middle of the book where Amie explains her bus situation to her boss Karen. I really related to this, since I also commute to work and know how much of a pain it can be. The way characters address one another doesn’t feel stilted and there is a nice flow to the dialogue. It’s also nice that none of the characters feel one-dimensional. Amie’s boss Karen for instance my seem like a bit strict, but she’s not mean or uncaring. I love how a character like this can feel so layered in only a single issue of a comic. Moving on to the artwork, to put it simply, it’s awesome! It has a very animated look to it with bright colors, simply drawn characters, and nice scenery. It really looks like it could be an animated series. This book looks really nice overall, especially on the tablet screen I read it on. The book is also really well-paced. A lot of this issue is setup the adventure likely to take place over the course of the series, but it never felt boring and I enjoyed pretty much every page of this issue. I took a random shot at this book because I follow the writer on Twitter and the premise, while sounding a little silly, at least seemed interesting. I’m really happy I checked this out, because this is one of my favorite first issues in a long time. The characters are really likable, the artwork is fantastic, and the story is just really fun. I really can’t wait to read the next issue. I’d say give this book a try if you’re look for a fun, all ages friendly comic with really nice, animated artwork. Hi everyone. It sure has been a while. I’m sorry I have not updated this or any of my personal blogs in quite some time. One of the reasons I started writing on WordPress is that I wanted to give my thoughts on subjects I really enjoyed. I really enjoyed Power Up, so I wanted to give my thoughts on it. I hope you enjoyed this review and hopefully I’ll be back again soon. I mean seriously, those My Little Pony comic reviews aren’t going to write themselves! Until then, take care! Will the ponies be able to fight a friend? After being kidnapped and having her greatest fears consume her, Rarity has become the new Nightmare Moon. 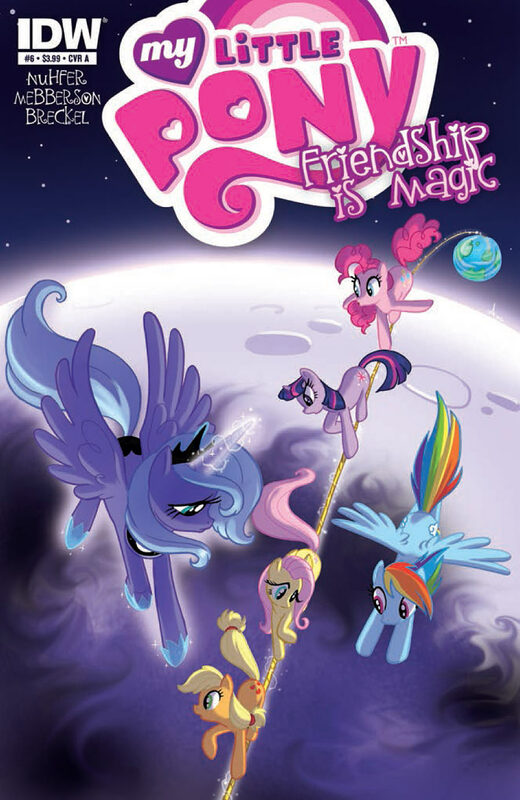 After having overcome the obstacles put before them in the last issue, Twilight, Princess Luna, Spike, and their pony friends must now try to save their lost friend from the clutches of darkness. However, with a legion of corrupted denizens at her disposal, Nightmare Rarity may not be so easy to overcome. This issue, at its core, focused a small number of characters, and despite most of the ponies being in play, along with some nice cameos, they are mostly left by the wayside. The first half of the issue helps us get aquinted with the new Nightmare Moon as her friends must fight of both her and the various shadow creatures at her beck and call. Later the issue focus on Spike, as he tries his best to free Rarity, the pony he loves. The dialogue from the ponies is spot on and true to each character, from Pinkie Pie’s attempt to free Rarity by telling an embarrassing story about her, to Fluttershy finding the beauty in one of the more grotesque creatures of the moon. The scenes in Ponyville where Princess Celestia attempts to prepare the town’s citizens for an impending attack help illustrate the threat of Nightmare Moon nicely. My main problem with this issue is the fact that Rarity as Nightmare Moon feels less groundbreaking to the ponies than I would have thought. The pacing of the story doesn’t allow for much reflection on the pony’s part, nor does it allow them to question how their friend could have possibly fallen to the evil specter from their past. The scenes featuring Spike are nice, showing just how much she cares for Rarity, as well as how resourceful the little dragon can be. It does run a little long, though, and doesn’t leave anymore room for Twilight and her friends before the issue comes to an end. The artwork from Amy Mebberson, with the colors of the Heather Breckel, continue the colorful symphony of fun I continue to adore from this series. The characters look very animated and expressive, while the backgrounds are more mute and less important to the characters filling them. Nightmare Rarity is also very well designed, with the stylish hair and uptight demeanor making a nice contrast to her predecessor. The moon is a dark and dank place with its citizens matching the environments well, but the addition of the ponies (and dragon) help them dominate each panel. It’s a nice mixture that really drives home the ponies are not from this world, which is an impressive feat. Andy Price may be unbelievable meticulous in the minute details, but Mebberson and Breckel bring their own synergy to make the comic familiar to fans of the show, yet unique in their own colorful style. 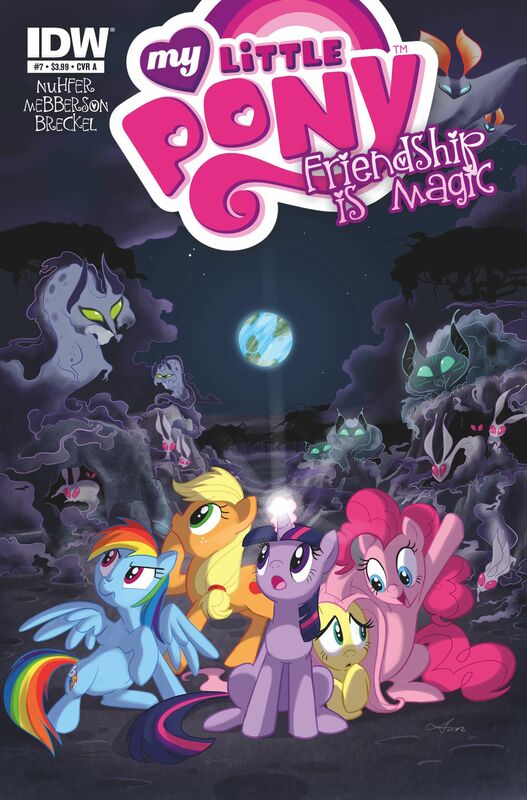 My Little Pony: Friendship is Magic #8 is a nice continuation of a decent story. The setup has a ton of potential, but the end result is a lot less ambitious. Not a bad way for the story to go by any means, but nothing that really blows me away. The story is well told, the artwork continues to impressive, and the ending helps build anticipation for the grand finale. A good, just short of great, pony adventure. The Ponies, Princess Luna, and Spike on a quest to find a friend. Last issue saw the abduction of Rarity to the moon, as well as the surprise arrival of Princess Celesia and Princess Luna. With the help of a magic-infused lasso, Twilight, Spike, Pinkie, Dash, AJ, Fluttershy, and Princess Luna embark on a lunar adventure to rescue their friend. However, dark forces are at work and they’ll stop on nothing to hold the ponies progress to achieve their terrifying goal. This issue features some nice characterization. The addition of Spike and Princess Luna, both of whom were largely absent from the previous story arc adds a some nice moments in the story. There’s an early moment between Spike and Twilight that perfectly captures their big sister/little brother vibe that’s a constant throughout the series. Luna, on the other hand, is an interesting character in general. Given her dark past and lack of social skills, she’s a polar opposite of her older sister, despite the fact they share the same kingdom. In this issue she’s seems surprisingly vulnerable despite her familiarity of her surroundings. It’s nice to see the ponies help Luna overcome her lack of confidence, and likewise see Luna guide the ponies as best she can on this dangerous adventure. The artwork is the same colorful and lively look that has become a staple of this series for me. Even on the dark and dreary moon the ponies are able to make any environment lively with the varied color palettes. While Amy Mebberson’s artwork isn’t as meticulous as Andy Price before her, she makes up for it with a lot of character detail and a look that is, while similar in design of the animated series, has a nice tone and feel all its own. The colors from the amazing Heather Breckal help lend this world an amazing level of visual depth and clarity. While the characterization is fantastic, the actual story in this issue is somewhat bland. Without spoiling too much, this issue goes into further detail of a sequence from last issue. While not outright bad, it does feel somewhat unnecessary and it feels like some moments were over before they started. Nevertheless it’s an interesting look at these characters and doesn’t ruin the issue as a whole, nor does it impact the shocking cliffhanger. 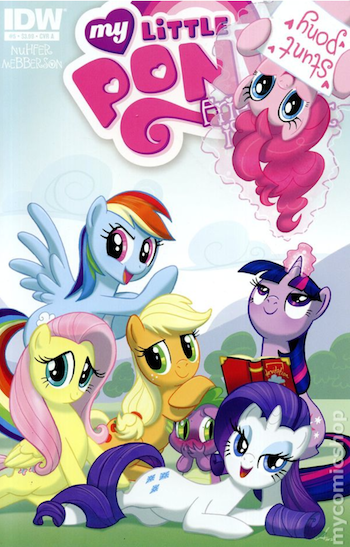 My Little Pony: Friendship is Magic #6 continues the series streak of great characters, blissfully colorful visuals, and self-contained entertainment. The story may not be as interesting as the characters in it, but the strength of the writing and artwork carry it to a finish. Greg Pak, Jae Lee and Ben Oliver take on DC’s greatest heroes! 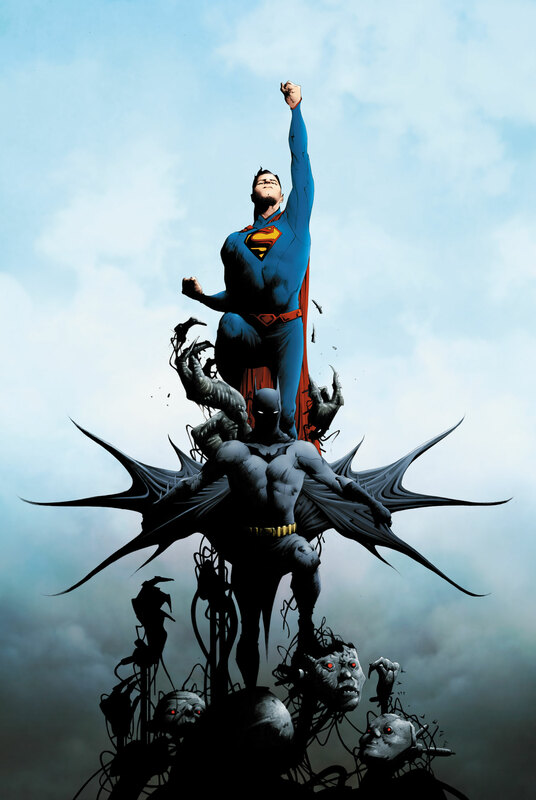 Batman and Superman are two of DC’s greatest and most recognizable super heroes. Both have conquered various media outlets and are no stranger to each other. However, in this new series by Greg Pak, who makes his DC Comics debut, the heroes actually are strangers to each other. In the New 52, the heroes of the DC Universe are about five years into the world of super heroes, but in Batman/Superman #1, we are close to the beginning of that five years. Batman and Superman, as well as Bruce Wayne and Clark Kent, are complete strangers to each other. While these two individuals are heroes fighting on the side of justice, their idea of justice could not be more different. However, when events occur that effect both heroes, these two meet for the first time, and the results are both surprising and hightly entertaining. Greg Pak absolutely nails the voices of these two heroes. Narration is provided from both characters point of view, and when they are together, it provides a clever back and forth giving us some real insight into how both characters think and react to a particular situation. It’s not just the polarity on display between the two characters, but the subtle similarities as well. Pak does a great job not only of informing us on who these characters, but enduring them to us as well. His voices for Superman and Batman are some of the best I can recall in any comic I’ve read either of them in. I have read Pak’s work before, but this is probably the best work of his I have ever read. The artwork is phenomenal! I wasn’t familiar with Jae Lee before reading this, but he has gained a fan in me. The art is very cool and dynamic, with cool shadows effects and action that is easy to follow and really visceral. I like how neither Batman nor Superman are super buff and have more eloquent statures; It makes sense since they are younger. I also love the older costumes that they wear; this is my first time reading a comic with the denim jeans Superman and it’s a nice look. Ben Oliver, who I know from his early Batwing art, does the last few pages, and it’s pretty good as well. It’s a little jarring with a few close-ups that look a little awkward, but it meshes well enough with Lee’s work. Batman/Superman #1 is one of the best first issues I’ve read for a New 52 comic in a very long time. Pak, Lee, Oliver, and company provide a fresh look for two timeless heroes that’s both enjoyable in its own right and provides a great addition to the world of the New 52. Having recently read both first issues of Batman: The Zero Year and Superman: Unchained, I can honestly say this is the one of best Batman or Superman comic issues I’ve read in a really long time. While I’ve had no real problem with either hero, I’ve never felt compelled to follow their solo adventures for one reason or another. This time, I’ve got no excuse. Pak has sold me on these characters like few other writers have, and I’m ready to dig in! A new creative team and a new adventure for everyone’s favorite ponies! After a wonderful first arc featuring great character work, amazing art, and the delightfully sinister villain in Queen Chrysalis, this ongoing series receives a changing of the guard with a brand new writer Heather Nuhfer, and artwork by series cover artist Amy Mebberson. The story begins with Twilight Sparkle being plagued with nightmares. After finding out her best friends, save for Spike, have also been plagued with similar nightmares, they all decide to have a sleepover at Pinkie Pie’s. However, evil forces are at work, one of the ponies is in major danger, and a visit from Equestria royalty ushers in a new adventure. The issue as a whole is well written. Heather Nuhfer has a nice handle on all the ponies, especially Rainbow Dash. Dash gets a large amount of dialogue, making me believe the multicolored pony has a fan in Nuhfer. She’s mostly true to Dash’s character, but I don’t think Rainbow should be this talkative and random to the level of Pinkie Pie, something Pinkie amusingly comments on. Another character Nuhfer writes well is the criminally underused Princess Luna. In the animated series, she has not gotten that much screen time, so it’s nice to have this comic arc utilize her to such a degree. Nuhfer’s Luna is somewhat subdued and somewhat reclusive, yet intelligent and authoritative. Her design definitely represents her nature with her dark color palette that is in stark contrast to the other ponies. I look forward to having her play a role in this story arc, and I think Nuhfer does a good job of fleshing her out. On the artistic side, things are looking good. While Amy Mebberson’s art isn’t as detailed and intricate as Andy Price before her, it’s full of personality and a nice storybook quality. With less on the page, she’s able to give the characters some details in expression and movement. There is this one scene in the issue that looks into each pony’s personal nightmare, and some are absolutely heart wrenching, despite most only taking up a single panel on the page. Her style is very attractive, and the colors from Heather Breckel continue to make this one of the most pleasant-looking comics I read. All in all, this story is off to a good start. Only time will tell if this arc can live up to the extremely high standards of the previous one, but I have high hopes. This wasn’t the best issue I’ve read, but it was still really good.